If you can’t reach agreement over how to split the finances between you (and see my earlier post for ways in which to do this, all of which are preferable to ending up in Court), then you may have to resort to going to Court. If that happens, the Court will help you and your ex-partner to reach a settlement or, if that is not possible, the Judge will ultimately impose a settlement on you both. Form A is used to ‘issue Financial Remedy Proceedings’: that means it’s the form you need to start proceedings over splitting your finances in Court. 1. If you are the Respondent in the divorce proceedings cross out these words in brackets. 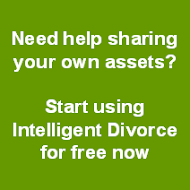 If you are the Petitioner in the divorce proceedings leave them. Since you are filling in this form, you are the Applicant for the financial proceedings, and your ex-partner is the Respondent. It does not matter which of you is the Petitioner or Respondent in the divorce. 2. Enter the name of the Court where the divorce proceedings have been issued. 3. Enter your case number, which will be on one of the divorce forms you’ve had back from the Court. 4. Enter your full name here (including middle names). 5. Enter your your ex-partner’s full name here (including middle names). 7. Enter your ex-partner’s full address, including the postcode. How you complete these boxes depends on which of you is the Petitioner or the Respondent in the Divorce. 8. If you are the Respondent in the divorce then you should tick the first box. 9. 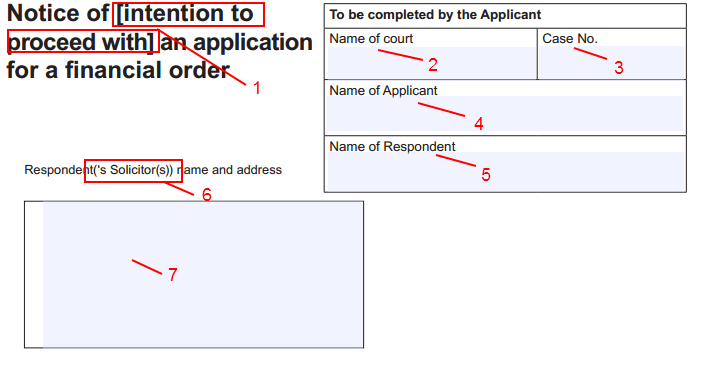 If you are the Petitioner in the divorce, you should tick the second box (you are ‘proceeding with an application’ rather than ‘applying’ because you have already made an application within the Divorce Petition, even though you may not have realised it!). 10. 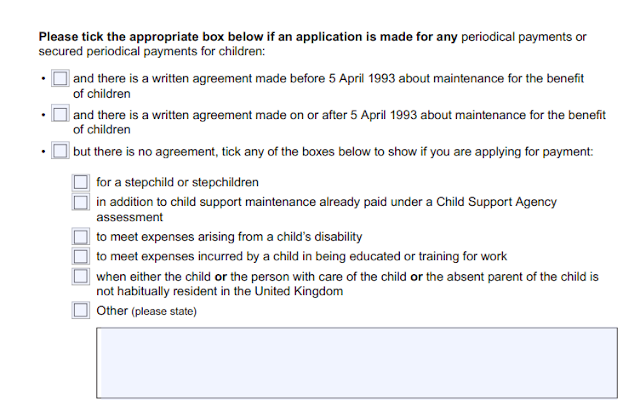 If you are applying to vary an existing Maintenance Order, you should tick the third box. 11. Maintenance pending suit: a short term maintenance order, made before matters are resolved to deal with the interim position (i.e. your ex-partner providing you with some income now whilst you wait for your financial agreement to be finalised). You will need to make a decision though on whether you want to ask the Court to deal with the interim position as well (i.e. to apply for income in the meantime before the financial proceedings are resolved). If you do, then you should tick the first box (11). I will deal with what happens, and what else you need to do, in a Maintenance Pending Suit application in a later post. 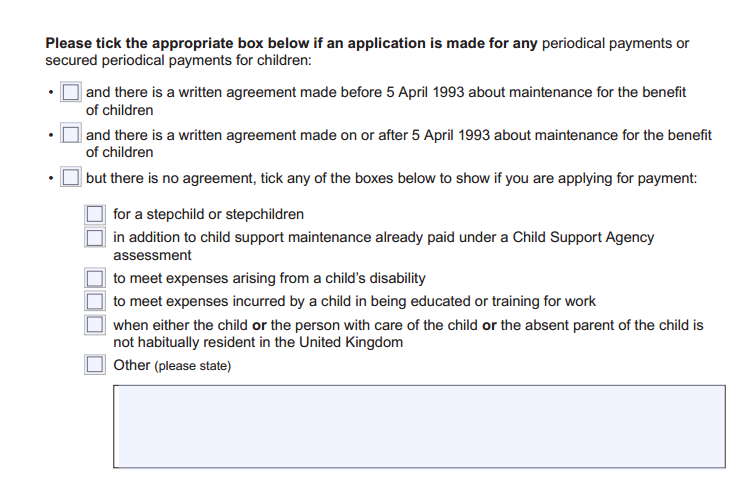 If you don’t need the Court to deal with the immediate situation, then leave this box unticked. 12. Secured provision order: maintenance secured against an asset – for example if it is secured against a property, and the payer defaults (stops paying) you can force the sale of the property to meet the arrears. 13. Lump sum order: payment of a lump sum to you. 14. Property adjustment order: the transfer of a property to you; if you tick this you’ll also need to give the property address in the box below. 15. Periodic payments order: this is maintenance. 16. Pension sharing order: the division of a pension. 17. Pension attachment order: the diversion of pension income to you. 18. Pension compensation order: the division of a pension that is in the Pension Protection Fund. 19. Pension compensation attachment order: the diversion of income from a pension that is in the Pension Protection Fund. It may be that you already know which Orders you wish to apply for – in which case tick the ones that apply. However in most cases you won’t know. The safest thing to do is to tick all the remaining boxes (remembering to enter the property address below (14) if you tick this one). This series of boxes above are rarely ticked. They relate to circumstances where child maintenance is sought via the Court. In the majority of situations the Court does not have jurisdiction to make an Order for child maintenance unless the parties agree. It is usually the Child Support Agency or CMEC that makes an order, as they now have the jurisdiction (i.e. power to do so). But if one of the situations listed here does apply to you then tick the relevant box. 20. I explained about Form FM1 in my previous post. Usually you will tick ‘Yes’ here. I would recommend that you do attend a MIAMS and try mediation before you issue a Court application as if you have not done so, the Court is likely to adjourn (i.e. postpone) the application at the First Directions Appointment (the first Court hearing) to enable you to do so, which will just delay the whole process. 21. Sign the form, deleting the words in brackets underneath the box. 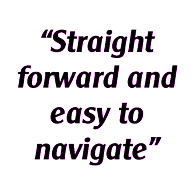 My next post will show you what you need to do with your now completed Form A.